Breeders’ Cup Week at Churchill Downs got off to a good start on a brisk, but clear Monday morning with dirt works from Yoshida (JPN) ($6 million Breeders’ Cup Classic) and Midnight Bisou ($2 million Longines Breeders’ Cup Distaff) headlining the work tab and the initial on-track appearance of European standouts Enable (GB) ($4 million Longines Breeders’ Cup Turf) and Roaring Lion (Classic) after they cleared quarantine. Working shortly after the track opened, Midnight Bisou worked 4f in 49. Following the first track maintenance break, Yoshida covered 4f in 49 3/5. Two-time Arc de Triomphe winner Enable and Roaring Lion, scheduled to make his dirt debut in the Classic, both jogged in the mile chute before returning to the barn. Accelerate – Trainer John Sadler is expecting his No. 1-rated older horse in the country to carry his “Mister Consistency” mark at least one more time before retirement as he takes his place in the starting gate Saturday in the Breeders’ Cup Classic, the climax to the 14-race World Championships at Churchill Downs. “Accelerate has had a really good season,” Sadler said. “He’s run in all the big races in California and won most of them. He went out of state once – to Oaklawn Park in Arkansas and had a tough trip that day and still ran a very good second; just got a beat a neck. Axelrod – Even though never off the board in his six races this year, the 3yo son of Warrior’s Reward is likely to be among the longshots in the Classic, but trainer Michael McCarthy is hopeful that he can gain some extra juice from his owner’s stable name, Slam Dunk Racing. Catholic Boy – The 3yo son of More Than Ready returned to the Churchill Downs racetrack Monday, a morning after breezing 5f in 1:01 under jockey Javier Castellano in preparation for a start in Saturday’s Classic. “He jogged this morning. We liked what we saw Sunday – I thought he was moving great – all the important details out of a breeze we like to see as trainers,” trainer Jonathan Thomas said. Catholic Boy, who jogged under exercise rider Tracey Brown, has worked twice at Churchill Downs, where the Travers winner especially impressed his trainer. Thomas sported a Boston Red Sox cap on the morning after the American League champions won the World Series. Pavel – Sabas Rivera, assistant to trainer Doug O’Neill, sent out Pavel to jog the Churchill Downs strip Monday morning for his first exercise at the Louisville track after his arrival Sunday from his Southern California base. Regular exercise rider and former jockey Amir Cedeno was in the irons. O’Neill is due to join his horses at the Churchill Downs barn Tuesday morning. Yoshida – In his last serious work before contesting the Breeders’ Cup Classic, WinStar Farm, Head of Plains Partners, China Horse Club and SF Racing’s Yoshida breezed at 7:30 a.m. for trainer Bill Mott. The time was officially recorded as 49.60 seconds and was 19th of 37 at the 4f distance this morning. It was the Japanese-bred son of Heart’s Cry’s second since arriving from Saratoga this month, following a more serious 1:00.80 move Oct. 22. Mott has a 14-2-0-3 record in the Classic, including a victory by WinStar’s Drosselmeyer at Churchill Downs in 2011. Japanese-breds are 9-1-0-0 at the Breeders’ Cup, with their lone victory courtesy of Karakontie in the 2014 Mile. Midnight Bisou – Bloom Racing Stable, Madaket Stables, The Elkstone Group and Bethlehem Stables’ Midnight Bisou logged her final serious piece of work ahead of Saturday’s Breeders’ Cup Distaff on Monday at 5:45 a.m. The Steve Asmussen trainee finished up a routine 4f in 49 flat, good for 12th quickest of 37 half-mile drills this morning. The move follows a best-of-37 bullet breeze last week at Churchill Downs in 1:00 flat. Bloom Racing principal Jeff Bloom was on hand. “It was picture-perfect,” Bloom said. “Angel (Garcia), her regular exercise rider, was aboard. She backtracked by walking around and stood there a little bit and then she just absolutely cruised through an easy half and had pretty strong gallop in about 1:02. It was as perfect as you could hope for. She pretty much cooled out by the time she got back to the barn and dropped her head, alert and happy. It went well. Monomoy Girl – Trainer Brad Cox reported the Kentucky Oaks winner came out of her Sunday half-mile work in good order and all systems were a go for entering the race later in the morning. In addition to Monomoy Girl, one of the likely favorites for the Distaff, Cox will saddle Arklow in the Longines Turf, Golden Mischief in the Filly & Mare Sprint and Will Call in the Turf Sprint. Vale Dori – Six of Hall of Fame trainer Bob Baffert’s contingent of Breeders’ Cup horses are scheduled to ship from Southern California on Tuesday to join Vale Dori and Much Better at Churchill Downs. 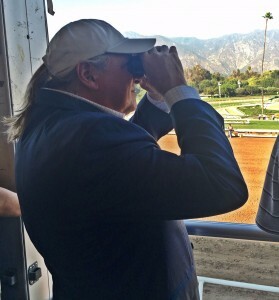 The shippers for Baffert, who is second to D. Wayne Lukas on the Breeders’ Cup trainers’ wins list with 14, and has a record three victories in the Classic, are Classic prospects McKinzie, West Coast, and Collected; Abel Tasman, Distaff; Game Winner, Juvenile; Marley’s Freedom, Filly & Mare Sprint. Much Better, bred and owned by Three Chimneys Farm, was pre-entered in the Juvenile Turf and Vale Dori, winner of the Zenyatta at Santa Anita, is headed to the Longines Distaff. The first of the European challengers for this year’s Breeders’ Cup were allowed out on to the Churchill Downs track early Monday morning having cleared the regulatory 48 hours in quarantine. All horses appeared to have taken the traveling well and appeared in good spirits. Roaring Lion (Classic) and Enable (Turf), both trained by John Gosden, did nothing more than head down to the mile chute and circle a few times to stretch their legs before returning to the barn. Imran Shadwani, the regular work rider of Enable also was happy with his filly’s condition. They were both part of a consignment of 23 European horses that arrived slightly later than expected at Churchill Downs at around 1:20 Saturday morning. This shipment was followed later in the day by five horses, all owned by the Maktoum family from Dubai, who arrived in the afternoon and this included last year’s Breeders’ Cup Turf winner,Talismanic. All the Europeans stabled in the quarantine barn went out on to the track this morning with the exception of Pocket Dynamo (Juvenile Turf Sprint). Lightning Spear (Mile), with trainer’s wife Jennie Simcock in the saddle, took to the main track and looked in great condition and like the Gosden pair went down to the chute to warm up before doing one circuit of the track at a gentle canter. There also was some action out on the turf track this morning when 10 overseas horses, including the Andre Fabre-trained duo of Talismanic and Waldgeist, who are both entered in the Breeders’ Cup Turf, stretched their legs around one circuit of the track before heading back to the barn. Talismanic seemed more at ease with his new surroundings. The Aidan O’Brien team from Ballydoyle, which will include Breeders’ Cup Classic hope Mendelssohn, are expected at Churchill Downs tonight at 7 o’clock but will not be seen out on the track until Thursday morning. Liam the Charmer – Thanks to movement among those horses originally ahead of him on the Breeders’ Cup Turf roster, Liam the Charmer made it into the body of the race Monday, spreading a broad smile across trainer Michael McCarthy’s face. He galloped a mile on the main track with exercise rider Nikki Diodoro in the irons. Quarteto de Cordas – Elite Performance Stable Pte Ltd.’s Quarteto de Cordas, who arrived in trainer Ian Wilkes’ barn Oct. 4 worked 5f in company in 1:04 2/5 over a turf course rated as good with jockey Brian Hernandez Jr. aboard in preparation for Saturday’s $4 million Longines Breeders’ Cup Turf. Working with Always Cool, an unraced 3yo, Quarteto de Cordas produced fractions of 13, 25 4/5, 39 4/5 and out 6f in 1:19 3/5. Quarteto de Cordas had worked 5f in 1:03 4/5 on Oct. 23. “I did not know anything about him when my agent called and said we had one to work for Ian,” Hernandez said. “I watched the ‘Win and You’re In’ race that he won in Brazil (the Grande Premio Brasil in June). Wilkes will have one other Breeders’ Cup starter in Champagne Problems (Longines Distaff). Training over the all-weather track at the Skylight Training Center in Goshen, Kentucky, Champagne Problems worked 4f in 49 1/5 Sunday and jogged there this morning. She is scheduled to make the short trip to Churchill Downs Wednesday. Bellafina – Kaleem Shah’s Bellafina galloped 1 1/2m and stood by the gate Monday under exercise rider Serafin Carmona. It was the third visit to the track at Churchill Downs for the daughter of Quality Road, who shipped in from Southern California Oct. 26. Trainer Simon Callaghan said Bellafina traveled well and made an easy transition to the surface. Bellafina has won three straight stakes since finishing second in her career debut July 4. She earned a berth in the Juvenile Fillies with a 6 1/4-length triumph Sept. 29 on the Chandelier, a “Win and You’re In” race at Santa Anita.